Happy Wednesday, everybody! How's the week before Christmas treating you? A more relaxed or more stressful time? Probably depends on where you work, I guess. If you could have any beverage in the world delivered to you right this moment, what would you choose? Could be something ordinary, could be something rare, could be something discontinued, could be something that doesn't actually exist. Sky's the limit! I heard someone talking about peppermint lattes yesterday and that sounded really appealing to me, hence the question. I don't think I've ever actually had a peppermint latte before though, so here's hoping my fantasy drink isn't gross? I'd ask for it to be made with soy milk and served with a candy cane on the side. I love destroying my teeth. How about you? Coffee? Absinthe? The tears of unicorns? I want a milkshake so badly right now. Either mint chocolate chip, pumpkin, or oreo with chocolate! I have a couple! Zaxby's has these birthday milkshakes that my friend and I got for my birthday this year. SO GOOD. I also crave Starbucks' eggnog lattes all the time. Lastly, I saw on Tumblr the other day a Mountain Dew drink that was around when I was younger and haven't thought about since: the flavor Pitch Black. I'm not a big fan of Mountain Dew except for their ~other~ flavors. I just want a chai tea latte to warm up because I'm so cold right now. Peppermint lattes are good too though! OOh I love the Skinny Iced Peppermint Mocha Latte (1 pump of each flavor and cream instead of skim milk) from Starbucks. You should def try it! Mmm mint chocolate chip milkshake sounds good! Guess I'm having mint cravings. What does Pitch Black taste like? I've never had it. I've only had regular Mountain Dew a couple of times too, come to think of it. I want to! Strangely enough though, there are no Starbucks around where I live. I'll have to make a special journey a couple miles away, lol. Really? Don't you live in NYC? Or do you live outside the city? I do live in NYC, in Brooklyn. The neighborhood in Brooklyn I live in just doesn't have any Starbucks for whatever reason... there are some chains around (Dunkin Donuts, Burger King etc.) but a lot of the businesses around here seem to be of a smaller, more local variety. There is a coffee shop I love near here but it's not independent! ohh well maybe the coffee shop near you has something similar? It was supposed to be a black grape flavor, but I don't even really know what that's supposed to taste like lol. I just know it always tasted very berry-like to me--and SWEET. Mmm, black grape sounds good. All this talk of discontinued drinks is reminding me of Coke BLAK - it was a short-lived coffee soda, if you never tried it. I really liked it, not sure why it didn't fare well. There's probably a tiny bodega somewhere in Miami with cases of the stuff in the back room, lol. But how to know where such places are? The peppermint mochas sound like too many flavors at one to me, but I do like to get peppermint hot chocolate. I'm not sure if I'd like it with coffee. I could go for some chai as made by one of my favorite Indian restaurants right now. Nicely spicy, strong tea flavor, and not mind-numbingly sweet like most commercially made chai. I remember a few years back when Starbucks reformulated their chai and one of the changes was MAKE IT SWEETER. It was ALREADY too sweet. Sadness. I sometimes make it at home with my own good tea and whole spices, but it's not instant gratification, you know? (I also have a bottle of rum I steeped chai spices in, which is the perfect thing in hot tea on a winter night). I am always in the mood for coffee! I like mine with almond milk and nothing else too fancy. Mmm, spicy chai sounds delicious. Not sure if you like coconut, but I got this one blend from Adagio teas called "Thai chai" - it's chai with coconut and lemongrass and it's soooo good. I brew it at home (of course) and add some sweetener, but try not to go too overboard with it. I agree that a lot of mass-produced chai blends are sickeningly sweet, bleh. When I have basic coffee I always do almond milk. Occasionally a dab of natural sweetener (like agave syrup) too, but almond milk is a must! 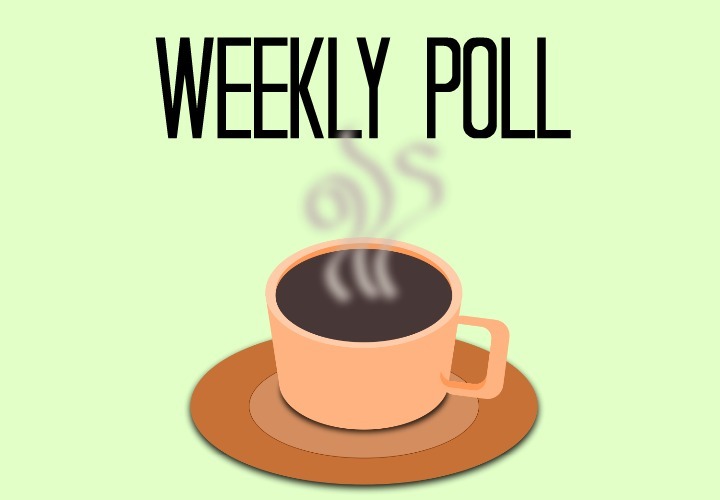 Weekly Poll: Happy New Year edition!